As you step off the plane in Yakutat, the little fishing village perched between Yakutat Bay and the northern reaches of the Tongass National Forest, the first thing you notice are the mountains. Just across the bay is the largest collection of peaks over 16,000 feet on the continent. These are dominated by Mount St. Elias, the second highest peak in the United States, which soars to 18,008 ft only 10 miles inland from the Pacific Ocean. This was my second trip to Yakutat to fish the Situk River, Alaska's premier steelhead river. Accompanying me were fellow PFF'ers Mike McGuire and Kelly Bandlow. (I had to twist their rubber arms hard to get them to come.) 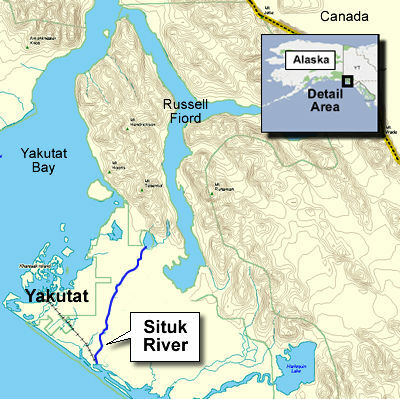 Yakutat is located in SE Alaska, about half way between the capital Juneau and Anchorage. In latitude it's about even with the border between the Canadian provinces of British Columbia and the Yukon Territory. To give you an idea of why this river is the best of the best, consider that in 2001-02, the last year I could locate data, the Trinity River hatchery reported 2,271 returning steelhead. The year before, they counted 842 forlorn steelies making the 90-mile passage to the Lewiston Dam. Last year the Alaska DFG enumerated 12,462 kelts on the Situk (migrating steelhead returning to the sea), a 50-year record. Typical runs average 8,000 fish. These numbers are even more impressive when you consider that the entire river is only 22 miles long and a cast wide in most places! There are two important reasons why nearly half of all steelhead caught in Alaska are caught in the Situk – the first is natural, the second is the result of human behavior. The man-made reason for the spectacular fishing is conservation, which primarily takes the form of a catch-and-release ethic; an unusual situation where normally "putting up meat" is the rule. 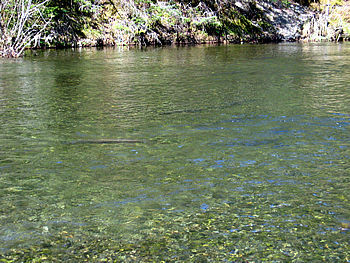 Other conservation policies that have undoubtedly helped the steelhead returns include stricter regulations on both commercial and recreational fishing. Rules now forbid the use of bait or scents, and most anglers are either fly fishing or using mono line on a fly rod. We used both techniques but the uncharacteristically sunny weather made the mono much more effective since it spooked the fish less. Think of it as fly fishing with a 100 foot leader. There are three main lodges in Yakutat and a number of smaller family-run operations. 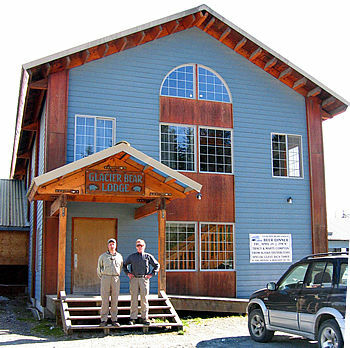 The larger lodges include the Glacier Bear Lodge, Leonard's Landing, and the Yakutat Lodge. I have only stayed at the Glacier Bear Lodge (GBL), a place I selected based primarily on a website photo and a description in Scott Haugen's book the "Flyfisher's Guide to Alaska." It is well managed and has absolutely fantastic food. It is quite a treat after a wet, cold day on the river to sit down to a piece of blackened halibut with mango chutney, a New York strip, or a huge plate of ribs. It makes the beer taste all the better. The three of us stayed in one room, which saved money and, heck, we're fishing. Kelly graciously volunteered to take the rollaway bed. We had a package deal with the GBL which included a rental vehicle (a huge Chevy Suburban), all our meals, and two days of guided fishing. Since I already knew some of the guides that work for the GBL, I requested the lodge set us up with Ron Pelissier, a California native who has been guiding on the Situk for about 10 years. I also had the GBL book an additional third day with Ron for us. 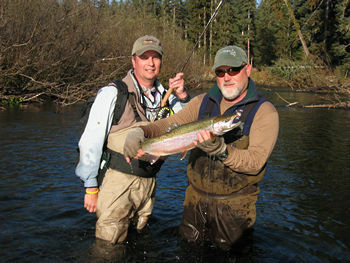 Not only does he guide for the GBL, but he owns his own operation there called the Yakutat Steelhead Inn. It would be a comfortable place for a larger group since you would have access to an entire house. While you can't drive very far in Yakutat, it is important to have transportation. There are only a couple of locations where anglers can access the river. The upper access at 9-mile bridge is 14 miles upstream from the access at the lower landing – just above the Situk's mouth. To get to either place from town requires driving several miles on dirt roads. To access much of the river in between, you'll need a boat. If I were to do the 14-mile drift in a motorless drift boat or pontoon, I would probably allocate at least 2 or 3 days. It is entirely possible to do it in one, but it will be a long, snag filled day with little time for fishing. There is no whitewater as the river meanders around the coastal plain with only a modest gradient. If creeping up on a 20 pound steelhead doesn't get your adrenaline going, how about stalking a run filled with 10 or 15 of them? The cardinal rule in California steelheading is move until you find fish. On the Situk, you can't move without finding fish. See any fish? There are at least seven here. As expected, the river changed dramatically from last year. What I remembered as a spectacular run last year was now a gravel bar. New trees have washed into the river and older ones have been washed downstream. For this reason, I've found a guide an absolute necessity at least for a couple days -- it's a sure fire way to determine where the best concentrations of fish are holding. Last year the lower river produced fish; this year most of the fish were in the upper river. We fished with Ron for three days. The first and third day we spent in his boat. The second day he showed us the trails and some great spots above the 9-Mile bridge, an area accessible only on foot.